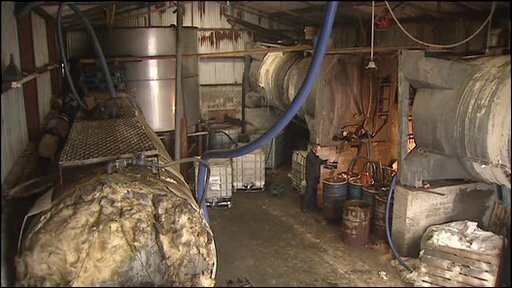 The largest fuel-laundering plant ever uncovered in Northern Ireland has been shut down by customs officials. The illegal diesel plant was discovered in County Armagh and was capable of laundering 6.5m litres of fuel a year. The plant, at Kilnasaggart near Newry, was dismantled in a joint operation with the Revenue's Customs Service, the PSNI and Irish police. A total of 25,000 litres of illegal fuel, four large storage tanks and other equipment was seized. Irish police seized a cattle truck with a hidden tank in County Louth as part of the operation. They also seized a number of other vehicles. John Whiting of HMRC in Northern Ireland said the diesel-laundering plant had the potential "to evade almost £3.2m in revenue every year". "People need to be aware of the environmental and safety issues surrounding the laundering of fuel, which is often done in rural locations," Mr Whiting said. "Indiscriminate dumping of the by-products from the laundering process can cause severe damage to arable land and our water systems, as well as taxpayers and local ratepayers having to pay for the clean up and disposal costs."